The Dawn Johnson Insurance Group, a Missouri-based insurance and financial planning firm with offices serving communities in and around St. Charles County, is joining the local branch of the Ronald McDonald House in a charity drive to raise funds that will support the families of children receiving medical care in nearby hospitals. 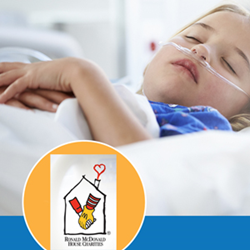 The Ronald McDonald House organization is dedicated to ensuring that children and their parents are able to remain close to one another when the child is receiving life-saving hospital care or treatment. RMH maintains a network of low- or no-cost temporary housing centers that allow parents to remain near their child as they receive care, allowing the family to remain together during tense and difficult times. “Ronald McDonald House has done more to help the families of sick children than any other organization on the planet, and this charity drive will help ensure that they are able to carry that mission forward into the future,” says Dawn Johnson, founder and manager of the Dawn Johnson Insurance Group. To publicize the charity event, Johnson and her team have constructed an online social media page and initiated an email awareness bulletin to keep community leaders informed. The Johnson Insurance team will also be producing a full page feature article discussing the charity event in the upcoming issue of the firm’s local interest webzine “Our Hometown”: http://www.dawnjohnsoninsurance.com/Our-Hometown-Magazine_39. Ronald McDonald House is the first charity supported by the Dawn Johnson Insurance Group as part of an ongoing community involvement campaign entitled “Agents of Change.” Going forward, the firm plans to gather support for even more Missouri-based charities, at the rate of one every sixty days. Those who want to join Dawn Johnson and her professional team during the Ronald McDonald House charity event are invited to visit the following page and make a contribution to the effort: http://www.dawnjohnsoninsurance.com/A-Home-Away-From-Home-For-Our-St-Louis-Families_14_community_cause. Those interested in tracking the new charities selected and supported by the Dawn Johnson Insurance Group over the months to come are invited to bookmark the firm’s Community Causes list here: http://www.dawnjohnsoninsurance.com/community-cause. As a Personal Finance Representative in O'Fallon, agency owner Dawn Johnson knows many local families. Her knowledge and understanding of the people in her community ensures that clients of Dawn Johnson Insurance Group are provided with an outstanding level of service. Dawn and her team look forward to helping families protect the things that are most important - family, home, car and more. Dawn Johnson Insurance also offers clients a preparation strategy for achieving their financial goals. To contact an expert at Dawn Johnson Insurance Group, visit http://www.dawnjohnsoninsurance.com/ or call 636-294-3500.